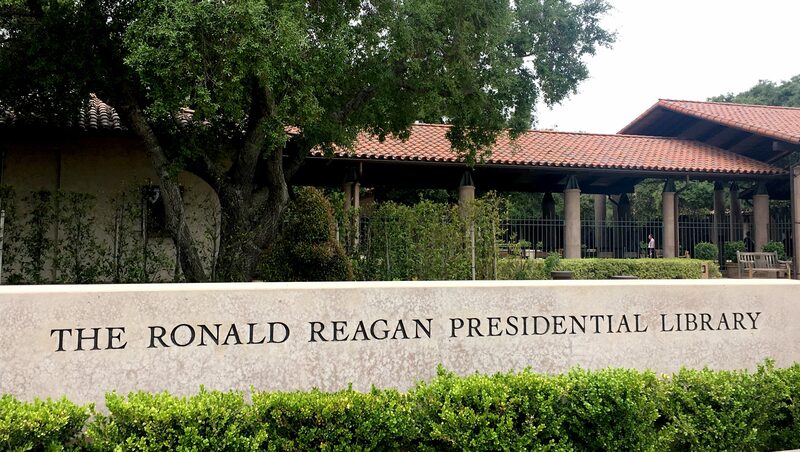 Today we left Santa Barbara for Thousand Oaks where the Presidential Library (Ronald Reagan) is located. We didn’t quite know what to expect but when we got there the trip was really worth it – not only was the scenic drive beautiful but the library itself- which really isn’t a library but a shrine to the 40th President of the United States with a great tour which gives an insight into this remarkable man’s life – from radio speaker- to Hollywood actor and then to president. It was quite a journey for him and while we toured the grounds we discovered some familiar quotes of his like „America is less of a place than an idea, and if it is an idea, and I believe that to be true, it is an idea that has been deep in the souls of Man.“ Anyhow, we learned a great deal about him and the problems he had to deal with especially regarding the Cold War and his relationship to Mr Gorbachev and how he challenged him to „tear down“ the Berlin Wall. Funny enough there was a piece of the wall standing outside. It felt a bit like home- not really, but there was something we knew by heart! The highlights of the library were a 1:1 replica of the Oval Office with a couple of real treasures from President Reagan, his Airforce One was there to see and to walk inside which was kind of surreal and not at all luxurious as one might think. But then again that was several decades ago and today it looks completely different. There was also an interesting exhibition on Genghis Khan which was really interesting and there was even a performance of dancers and musicians which was really neat. Anyhow, after this very fun morning we went shopping at a mall but before we did that we went to have a burger at the place which not only Mrs Neuschitzer recommended but pretty much everybody we spoke to, so we were quite curious about what the rave was all about. Once we got there we were surprised at the very limited number of choices- basically you could get a hamburger, a cheeseburger or a double double. Anyhow, we knew what we wanted and after some waiting we ate the most perfect burgers ever. They were fresh, delicious, the fries were hand cut- and that from a fast food restaurant! well now we know, where we’ll eat the next time we come to California – and you should try that, too!